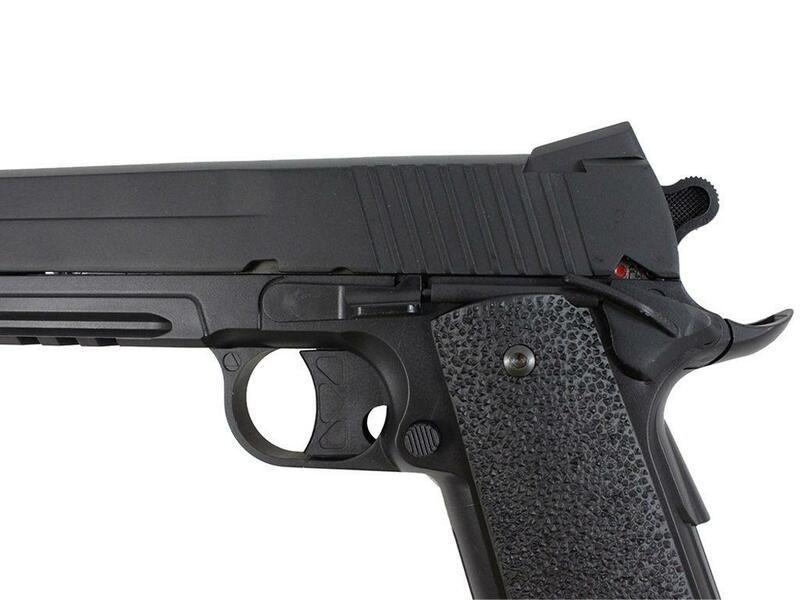 KWC G1911 Fixed Slide CO2 Airsoft Gun | ReplicaAirguns.ca | Easter Weekend Sale! 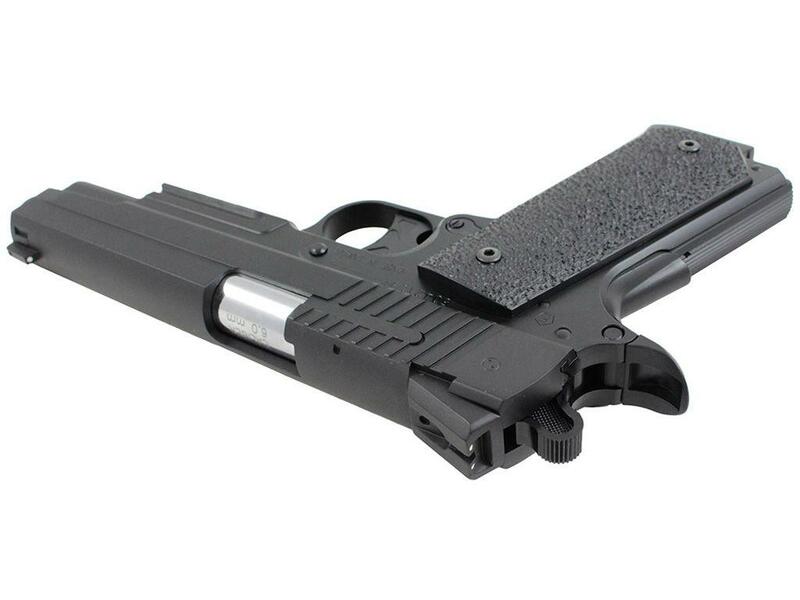 Trigger Pull: The trigger pull on the KWC G1911 Fixed Slide CO2 Airsoft Gun was about medium to hard but I have definitely experienced heavier trigger pulls on many double-action only airguns. 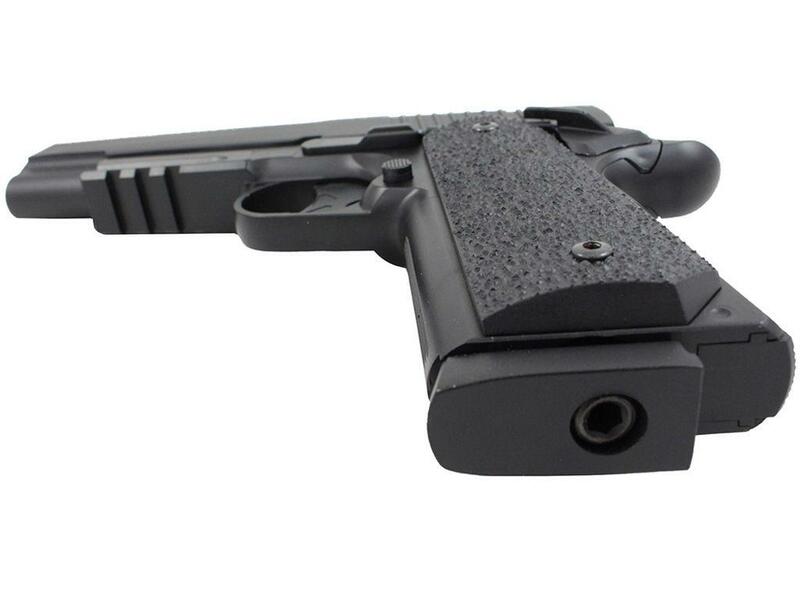 It is nice that the trigger has the look of a 1911 and not your typical lever-styled trigger. I did find the trigger to be very usable and the release point is smooth and fairly predictable. Accuracy: I have yet to perform my field test shooting component for the KWC Model 1911 All Metal Non-Blowback CO2 Airsoft Pistol, however I have reviewed the same gun in 4.5mm Steel BB version and here is what I had to say about that the Steel BB version: "Accuracy was decent but not outstanding, I got around a 2.5 inch grouping from a 20 foot away free standing position, shooting just to the left and high on the target. I did find that I was able to zone in a bit better with the GSR 1911 as I got used to the trigger. I also put the Sig Sauer GSR through my Chrony Chronograph and got very close the manufacturers 397 claimed feet per second, actually starting off well above it and settling down to around the 370 FPS mark. My 8 shot average on a new CO2 was actually 422 FPS. Build Quality: Very good, this is an almost all metal airsoft gun with a few exceptions like the hammer, trigger, magazine release, slide catch, and grip safety. Everything else is metal including the slide, frame, magazine, and even the grips. The finish is very good and since there is lots of metal with minimal moving parts and less to go wrong, this should make for a very reliable pistol. Realism: This pistol is very close to the look, weight, and feel of the real steel Sig-Arms 1911 GSR! Even the 1911-style trigger was replicated as best as it could be given it being double-action only. It would have been nice to have a single-action trigger and a working slide to finish off the illusion but overall, the GSR is a really nice copy. Non-blowback and the slide does not move either. 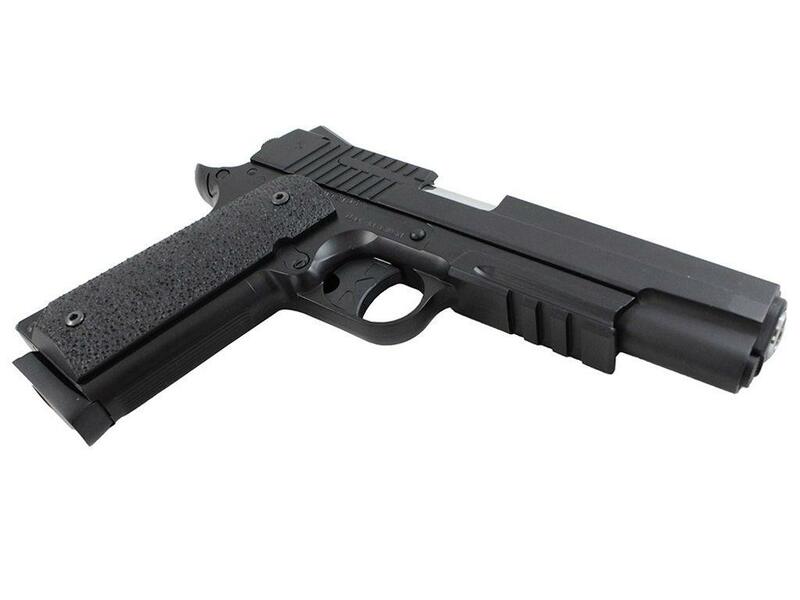 Comments: For a relatively inexpensive full metal airsoft gun you get a lot for your money with the KWC Model 1911. Most importantly, it's a very accurate reproduction of the real steel Sig-Arms Sig Sauer 1911 GSR firearm! 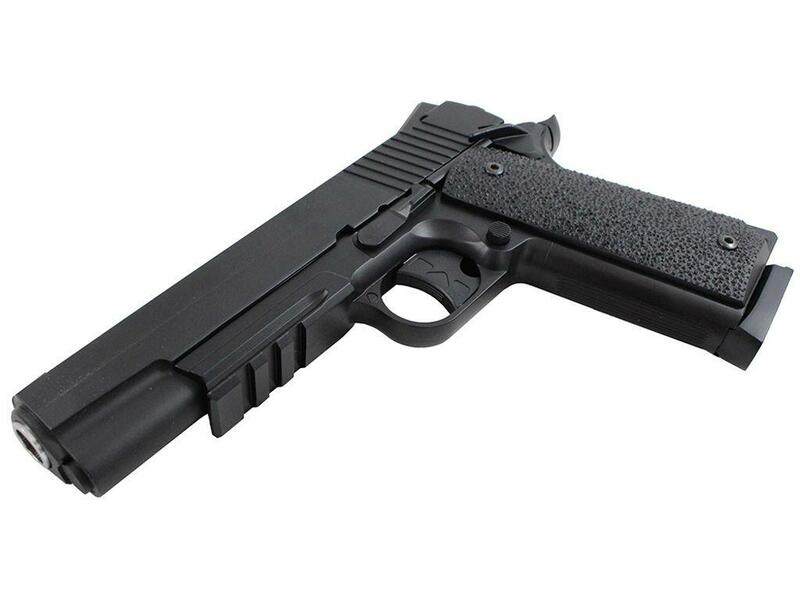 If you're a 1911 fan and want to pick up an airsoft gun that won't set you back too much, then the KWC Model 1911 would make a great choice with its heavy full metal weight, full size drop-out metal magazine, accurate reproduction of the real steal Sig-Arms GSR and that very affordable price tag. Very nice starter airsoft pistol Very good for what you pay for. Good gun, cheap and reliable. 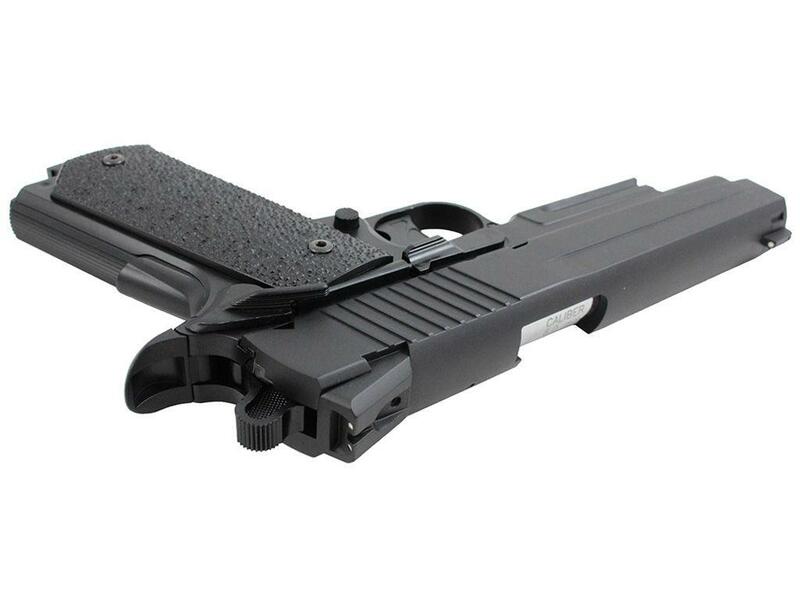 This KWC KWC G1911 is an amazing, it looks very relistic to a real version. Very impressed with shipping and the quality of the item. Looking to purchess more air soft guns in the near furture. 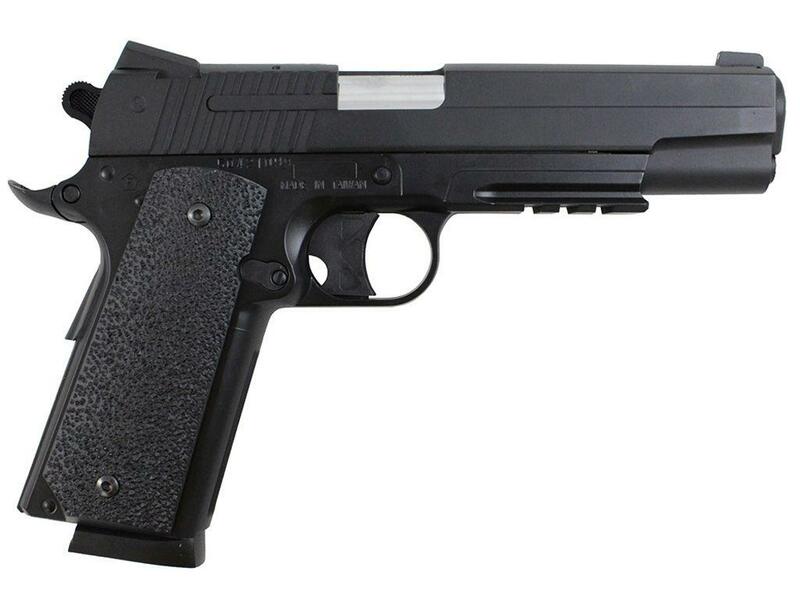 This video is a walkthrough review of the KWC Model 1911 CO2 Airsoft Pistol. I show off the All Metal KWC 1911 Non-blowback Airsoft pistol close up and talk about its specifications and features. For a relatively inexpensive All Metal Airsoft gun you get a lot for your money with the KWC Model 1911, most importantly a very accurate reproduction of the real steal Sig-Arms Sig Sauer 1911 GSR firearm! 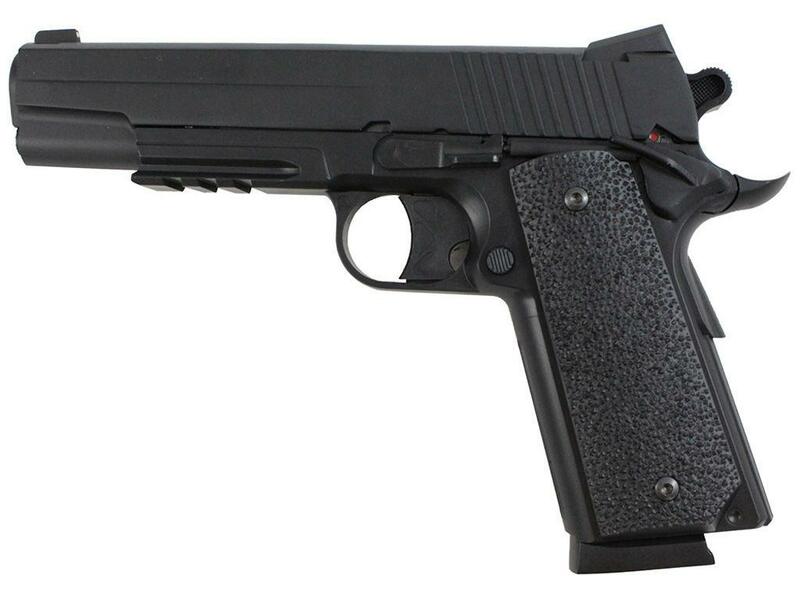 If you're a 1911 fan and want to pick up an Airsoft gun that won't set you back too much, then the KWC Model 1911 would make a great choice with it's heavy full metal weight, full size drop out metal magazine, accurate reproduction of the real steal Sig-Arms GSR and again that very affordable price tag.